All Products > "58607 Tamiya BRZ R&D Sport 14 Fuji TT-02"
This R/C model assembly kit recreates an entry in the GT300 class of the 2014 Japanese Super GT racing series that featured a turbocharged 4-cylinder boxer engine and tight cornering thanks to a low center of gravity. Drivers Kota Sasaki and Takuto Iguchi achieved stand-out results such as second in Rd.3 at Autopolis and a pole-to-flag win in a wet Rd.5 in Fuji. The form of the car, a wider low-bonnet version of the road model, is depicted faithfully in polycarbonate. 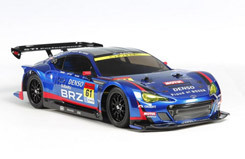 Separate parts are included in the kit to recreate the side mirrors and rear wing, and markings are provided to recreate BRZ and sponsor logos, as well as car numbers. The shaft driven 4WD TT-02 chassis employs a longitudinal layout with the battery on the left and the motor on the right, to offer excellent stability. In addition, it features identical left and right suspension arms and uprights for ease of assembly, plus easy-to-maintain gearboxes. It is a highly adaptable chassis, as it offers 2 different wheelbases, 2 ground clearance settings and 2 tread set-ups in addition to a range of 10 possible gear ratios. It is not short on looks either, with brake disc-shaped wheel hubs and stylish front bumper supports. Black mesh-type wheels are paired with racing slick tires.